With its glassy glaciers, hot thermal springs, spectacular geysers, active volcanoes, lava fields, stunning waterfalls and snow-capped mountains, Iceland is indeed the original ‘land of fire and ice’. Iceland, the second largest island in Europe, lies close to the Arctic Circle northwest of Scotland and south of Greenland, and it is primarily the unique and wonderful natural phenomena that draw visitors to the country. The hardy Icelandic people, descendants of ancient Norsemen and Celts, are intriguing too, having spawned what is now renowned as the oldest-surviving parliament in the world (called the Althing), founded in 930 AD. Iceland also boasts a much-revered literary heritage of the best medieval works, mostly based on heroic sagas. 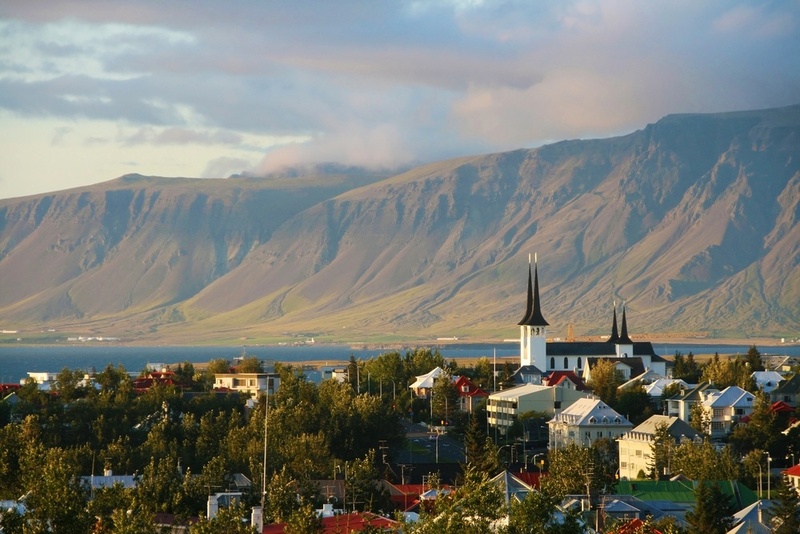 Most of the country’s popular tourist features are in the south of the island near the capital, Reykjavik, and can be explored on the much celebrated ‘Golden Circle’ route. Top of the list for scenic splendour are the Gullfoss double-tiered waterfall and the spouting hot springs of Geysir. Reykjavik means ‘smoky’, but in the case of Iceland’s pristine capital (which is Europe’s most northerly capital city) the smoke is not smog, but rather steam from the underground springs that warm the city. Reykjavik has a well-deserved reputation for being one of the cleanest, most invigorating cities in Europe, and boasts one of the highest standards of living in the world. The city may be small, but it is full of interesting attractions, from galleries and museums to thermal bathing spots, and the nightlife is second to none. Iceland is steadily increasing in popularity as a travel destination, and offers so much to see and do that repeat visits may be necessary, particularly as the country seems so different in summer and winter. The summer weather enables all sorts of outdoor fun in the gloriously unique landscapes, but the icy winter months bring with them the spectacle of the Northern Lights, truly one of the most magical experiences the world has to offer. Icelandic, but English is widely spoken. The borderless region known as the Schengen Area includes the following countries: Austria, Belgium, Czech Republic, Denmark, Estonia, Finland, France, Germany, Greece, Hungary, Iceland, Italy, Latvia, Lithuania, Luxembourg, Malta, The Netherlands, Norway, Poland, Portugal, Slovakia, Slovenia, Spain, Sweden and Switzerland. All these countries issue a standard Schengen visa that has a multiple entry option, and which allows the holder to travel freely within the borders of all the aforementioned countries. Additionally, foreign passengers to Iceland must hold return or onward tickets, the necessary travel documentation for their next destination, and sufficient funds to cover their stay in Iceland. NOTE: It is highly recommended that your passport has at least six months validity remaining after your intended date of departure from your travel destination. Immigration officials often apply different rules to those stated by travel agents and official sources. The unit of currency is the Icelandic Króna (ISK). Iceland’s three banks, Íslandsbanki, Landsbanki Ísland and Búnaðarbanki, all offer foreign exchange facilities and can be found in even the tiniest villages. Most have ATMs on their premises, available after banking hours, which are usually Monday to Friday from 9.15am to 4pm. Credit cards are widely used in Iceland for purchases and cash advances. Icelands electricity supply is 230 volts, 50Hz, as it is in most European countries. Plugs and sockets are of the two-pin type typical of Europe.